Icard said the initial plan was to use age agnostic, meaning reactants can be x 4 x 5 feet and weighs in at approxi- fuel cells to power underwater vehicles supplied via compressed, cryogenic, or mately 840 kilograms, while a 600kwh directly, but “we deter-mined that there solid-state reactant storage systems. The (16kW continuous power), 3,000 kg ver- is too many con? 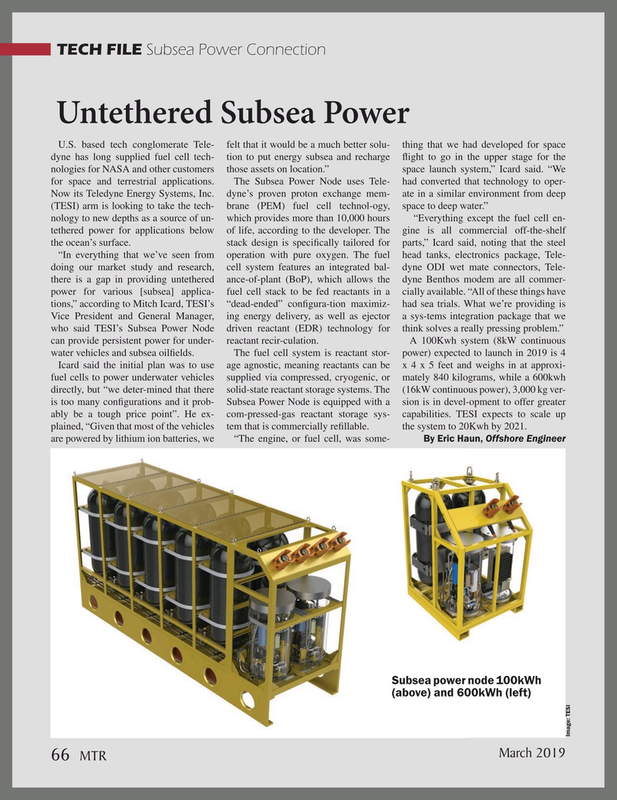 gurations and it prob- Subsea Power Node is equipped with a sion is in devel-opment to offer greater ably be a tough price point”. He ex- com-pressed-gas reactant storage sys- capabilities. TESI expects to scale up plained, “Given that most of the vehicles tem that is commercially re? llable. the system to 20Kwh by 2021.